West Virginia covers 24,231 square miles and has a population of 1,852,994 people. 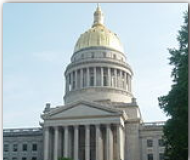 West Virginia’s capital is Charleston, which has a population of 51,400. Other important cities are Fairmont (pop. 19,320), Morgantown (pop. 29,660), Huntington (pop. 49,138), Parkersburg (pop. 31,492), Wheeling (pop. 28,486) and Weirton (pop. 19,746). West Virginia was admitted to the Union on June 20, 1863 as the 35th state. The state flower is the “Rhododendron” and it’s nickname is “The Mountain State”. West Virginia’s economy is broken into two categories; agriculture and industry. Cattle, dairy products, poultry and apples provide for the agricultural side. While chemical products, mining, primary metals, stone, clay, and glass products and tourism provide for the industrial side.